Chobits | Anime With A Side Of Sarcasm! Chobits is one of those animes that I started to watch maybe two years ago stopped at like eps eight cause I got bored then stared to watch it again a few months ago and was actually entertained by it. Why the change who knows but, it changed my rating of a two to a four lol. 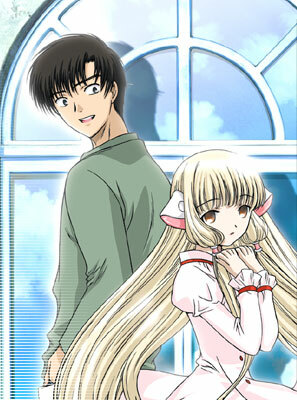 The main arc of Chobits starts with Hideki who moves toTokyofrom the country to enroll in prep school. Hideki is studying to pass the entrance exam into a university. Once Hideki arrives inTokyohe is in awe of all the things that he sees having come from a small farm. One of the things being the persocons that are everywhere. Persacons are basically AI/androids that look and act like people but are personal computers that can do everything from type papers, make phone calls, surf the net, play video and act as a external hard drive in a sense. As he is side tracked by all the new things that he was seeing (having grown up on a farm he really only had cows as friends and never used a computer before) he happens to stumble upon the apartment that he was going to be renting. After meeting the nice manager of the aparments, Hibiya Chitose, he goes to his room to only be surprised by his new neighbor Shinbo and his mini persacon Sumomo. As Shinbo helps Hideki get settled he lets him know that not only are they neighbors but they are also going to the same cram school! Hideki’s head is swirling with all the things that have happened to him in one day especially meeting his first persacon. He ends up taking a walk later that night and stubbles across what he at first thinks is a body but turns out to be an abandoned female persacon. Being the good natured guy that he was and also being curious he decides to take the persacon home with with him. Once home he then has the issue of trying to figure out how to turn it on. Little does Hideki know this is only the beginning of a LONG list of problems and trials! After some struggling with what to do, he finally figures out how to turn her on. (Yeah wont go into that tidbit cause it’s a little ‘personal’ where the on/off switch is lol) During the struggle Shinbo ends up trying to come over to see what is going on but Hideki keeps him away trying to hide his persacon. Once the persacon wakes up her first words are Chii. This being the only thing that she can say Hideki ends up calling her Chii. The next day Hideki wakes up and realizes he now has a persacon but has no clue what to do with it! Shinbo finally figures out what is going and meets Chii. He trys to help Hideki by using Sumomo to figure out who Chii is and if she belonged to anyone but Sumono is unable to get into Chii’s system and ends up chrashing leading Shinbo to believe that there is more to Chii then meets the eye. The next main character is introduced at this point is Minoru who Shinbo sends Hideki to for help in figuring out Chii’s story. Minoru is a gurus of persacons and has a collection of custom persacons. He is also considered to be one of the top resources on persacons yet he is only like 13 years old! After Minoru hooks his personal persacon up to Chii and Chii crashes it, he is completely intrigued and insist on figuring out what the deal is and where Chii came from. He goes to the net and sets out looking for anything that he can find. The story progresses with Shinbo, Hideki and Minoru set out on a mission to figure out what Chii is exactly. Between prep school and trying to teach Chii well, everything from simple things like clothes and communicating with people, Hideki and Chii both get jobs and start to settle into life together and life inTokyo. This leads to each episode filled with antics up the wa-zoo while Chii trys to figure out everything that she can and ends up causing in the process. Hideki just trys to deal with school, work, Chii and getting by from day to day! You quickly find out that Hideki is basically an idiot. Not only in his studies but also in just general day to day stuff. There are numerous arcs in the anime that can get confusing at times. You have Shinbos affair, Chiis job, Hidekis job, people out to get Chii as news of a strange persacon hits the net, people kidnapping Chii and the darker side to the anime about the creation of Chii. With the darker part it doesn’t come out till more towards the end and will throw you for a loop because of the people involved and the real story behind the creation on Chii. Overall this was a cute anime with a odd little love story between Chii and Hideki. The ending though leaves you with a huge WTF because all of a sudden it takes a crazy turn from where the first 18 episodes lead you. Its still good though and I am glad that I decided to finish watching it.